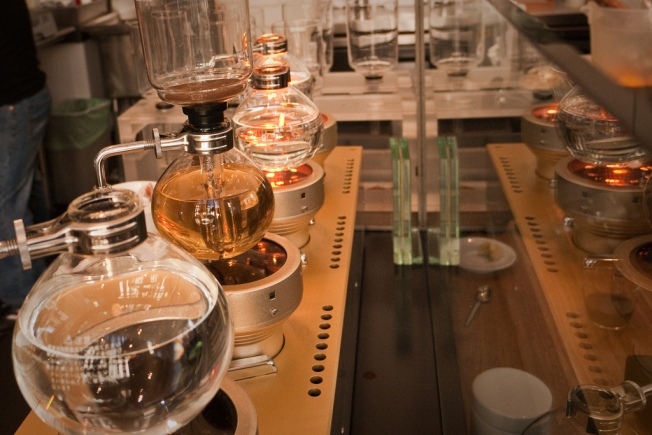 Blue Bottle's fancy siphon machine at work. Hipsters with fancy tastes rejoice: there is a new spot to get your Blue Bottle fix in the City. Spin City Launderette & Coffee in Noe Valley has just upgraded the brewing practices of its cup of joe by adding cult favorite Blue Bottle Coffee to its menu, according to Noe Valley SF. The Oakland-based coffee vendor has two cafes downtown and fancy restricted access kiosk at SF MoMa. But Blue Bottle also supplies several restaurants and shops across the Bay Area with its delicious beans. The next time you are in Noe Valley and have a hankering for rich -- and expensive -- coffee, head down to 26th Street and Sanchez and bring your dirty clothes with you.